"Importnace of digital customer experience innovation"
How important is the digital customer experience innovation? Creating a compelling digital customer experience has become the challenge for any business today. How can we retain a customer who never visits any branch physically? Maintaining customer relationship is the key to business success. Managing customers is not an easy task but an impossible one, and more importantly not an act of faith, but mainly a common sense journey. The challenge is how we do create a digital experience so compelling that our new and old customers would embrace it with the same or even more enthusiasm as they do with traditional face to face experience. This whitepaper presents a very pragmatic and easy to follow recipe, and other magical tech ingredients together to produce the best digital experience for your customer at the lowest possible cost, so we can call it “The recipe to your digital success”. 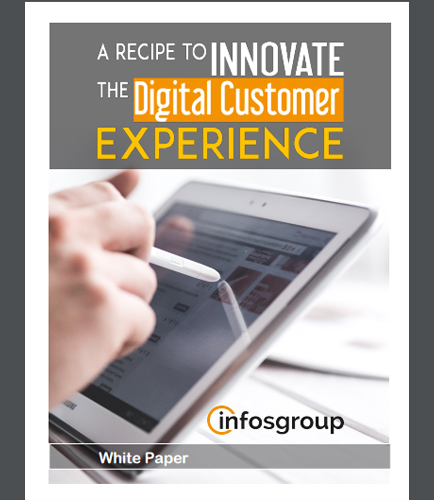 Download this whitepaper to learn more about improving customer experience through digitization and the right ways to create a great digital experience.